About 6 weeks ago I moved from the Netherlands to the U.S. Ever since I’ve had a great time living my American Dream. While making a couple of awesome road trips, organising our upcoming wedding, and decorating our new apartment I came across a few things truly American I didn’t know about, despite dating an American girlfriend for a couple of years. In the U.S. there are hardly any electronic measurement devices that can check your speed and automatically ticket you. 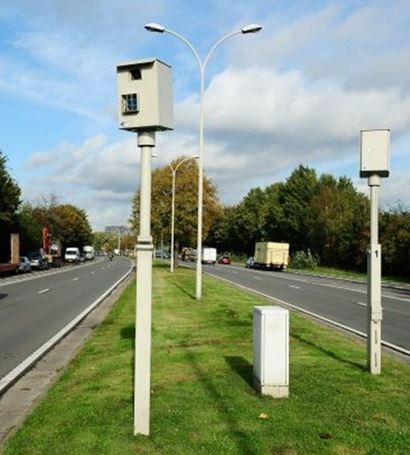 In the Netherlands, one should be careful of driving more than 3 kilometers per hour faster than the speed limit, for if you pass one of the (many, many) cameras you automatically get a ticket. In the U.S., speed is checked by police officers. They hide themselves along the road and pull you over when you are speeding. The sensitivity is, however, much lower – they only pull over the more extreme cases. Therefore, in the U.S. you’ll see people driving 10 miles above the speed limit more often than not. During my road trips I was often the slowest car around. In the U.S. it is allowed to turn on red unless you specifically told not to do so. If you make a right turn, and there is no traffic in your way, you are often good to go. I am not used to this rule just yet. Americans find it their God-given right to drive a car and park it. Therefore, there are always plenty of parking spots around that you can use for free or a ridiculously small amount. By far the scariest difference come from different rules at intersections. In the Netherlands (and most of Europe), if there are no signs visible to you, you have to yield to people coming from the right. In the U.S. if there are no signs visible to you, you have the right of way. The U.S. has no rule of yielding to someone from the right – if you need to yield, a stop- or yield-sign will always tell you to do so. Why is this scary? 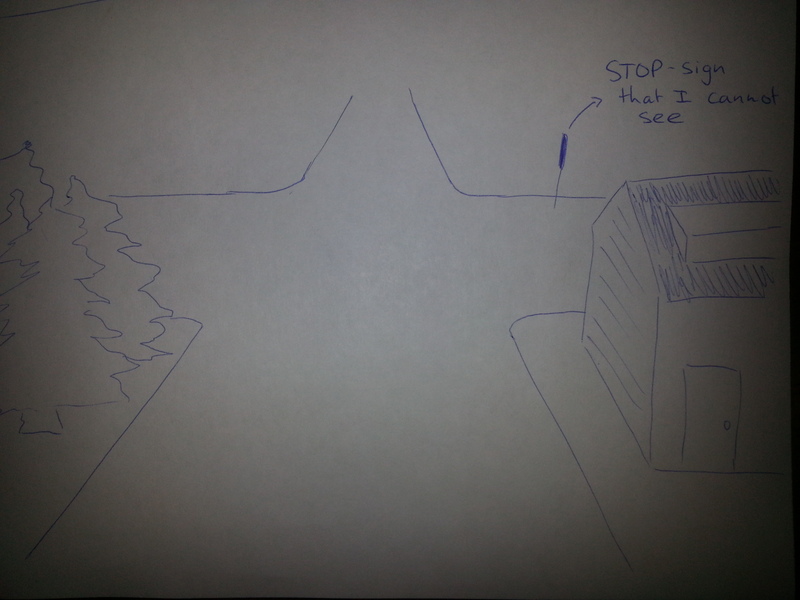 Whenever I am driving on a road and I approach an intersection at 35 mph, I see no stop- or yield-sign, my intuition based on 8 years of driving in Europe is to hit the brakes immediately – especially as most often I cannot see his or her stop-sign, if it’s there. I tried to draw the situation. Imagine that you want to keep going straight. In Europe, you would have to slam the brakes, those coming from the right have the right of way. In the U.S., you can just drive on. SCARY to ignore your intuition like this! I already noticed in movies that Americans don’t have a hallway in their house. If you open the front door, you often directly step into the living room. This has an interesting effect in apartment buildings like our own. The walls are thick enough to keep noise in (or out), but the doors aren’t. So if you walk through our central hallway, which gives access to the apartments, it’s very easy to hear the neighbours’ fights or to figure out what they are watching on TV. In the U.S., wherever you are, water is almost always available for free somewhere nearby. In public and often even in commercial areas you’ll find plenty of water fountains. If you go to a restaurant, water is almost always free as well. I noticed this on some of my first dates with Sarah: differences in the dining etiquette. Europeans eat with their fork in the left and knife in the right hand, and keep it that way. Americans hold the fork in the left and the knife in the right hand when they use the knife. But when they are done cutting, they take the fork in their right hand to use it to transport the food into their mouth. Remember this if you’re trying to make a good impression over dinner! In the U.S. restrooms are abundant and free. Along highways and near tourist hotspots, you’ll find plenty of restrooms which you can use for no charge at all. Extremely convenient! These public restrooms, however, have a somewhat awkward design. The walls around the toilets often hang more than 15 inches or 40 cm above the floor for safety purposes, with big cracks between them. You can see anyone entering the bathroom which gives you the feeling they can see you too. 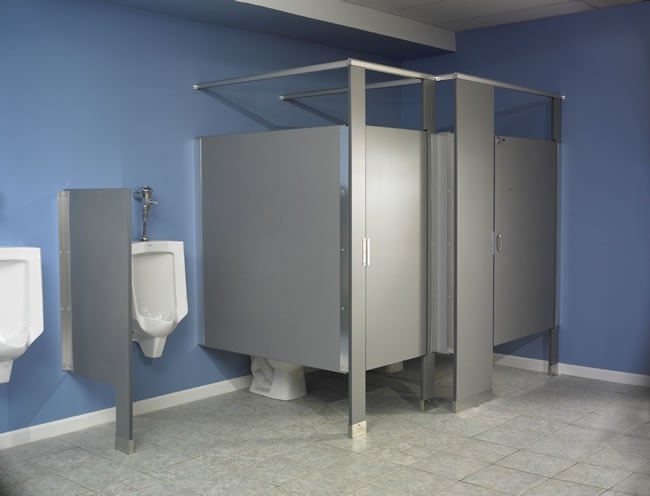 Not so private American toilets – and these are certainly not the worst! Americans have a different system to lock the bathroom door. You have to push a little button in the middle of a round door handle. You then have to believe that the door is indeed locked – there is no way to check it from the inside, as turning the handle (from the inside) opens the door regardless whether it was locked or not. In Europe the one answering the phone makes him- or herself known right after picking up. In the U.S., the one answering just says “Hi”. The one making the call then makes him- or herself known first. But if you are calling a company in the U.S. you do not make yourself know at the beginning of the conversation, paradoxically, unless your name is asked for. After so many awkward phone conversation beginnings, I still cannot get used to it. First of all, there are ‘negative’ commercials. Commercial and political adds to do not only emphasise their own positive sides, but also highlight weaknesses or disadvantages of their main rivals. Political candidates lashing out at one another are usually quite annoying, but there are also somewhat funnier examples. In the example below, Chevrolet makes fun of the Toyota Camry as it is not connected to Internet. This entry was posted in Travels and Trips and tagged culture, Europe, fun, immigration, Netherlands, travel, United States. I knew a bit of the food etiquette already, but the differences in driving were very eye-opening! I have to comment on this because I think some of your labeling of “American” ways are isolated incidents. Same way you wrote about some “Dutch” labels hehe. You cannot turn on red in every state, like New York for example. There is not parking everywhere especially in big cities. Many people have entryways in their homes. Finally, many Americans dine properly. If someone is switching the knife and fork that doesn’t make any sense to me either and I am American. Hi! I saw that you liked my blog post and wanted to thank you! I admit that I normally just skim over other people’s blog post, but I read yours all the way through and even reread it out loud to my husband. It is very interesting. I am excited to actually read more of your posts! The one about phone calls made me laugh. If someone calls me and asks me who I am, I may get upset. I mean you called me, who are you!? Hehe.